I AM NOW HEALTHY AND FIT because I decided that enough is enough. Meet Monique Stoffberg – a happily married 49 year old corporate financial advisor and mom to an 18 year old daughter. Monique is a participant on Genoeg – a new program on VIA, DSTV Channel 147 which airs from the 15th January 2018 until the 9th April 2018 – with health experts Pierre Spies (performance coach and personal training specialist) and Gert Coetzee (pharmacist and diet pioneer who founded The Diet Everyone Talks About) who give hints and tips on how to start your journey towards a healthier you. “I decided to join The Diet Everyone Talks About lifestyle program and participate in Genoeg because my weight gain was starting to have a negative impact on my life. I started becoming tired of how I looked and I felt worthless. My self-esteem was at an all time low. I wanted to gain my self-confidence back so I knew that this program would help me achieve that. I joined in August 2017. Being supervised and weighed regularly is what helped me stay on track. Weight loss was always a struggle for me because I am an emotional eater. My sugar levels became high after I was diagnosed with Bilharzia and I was also going through menopause. The weight gain became worse after my father’s death and that’s when I reached the point of enough is enough! It was time to take charge and do something about my weight. I have participated in the comrades marathon before and my goal was to be able to do that again,” says Monique. 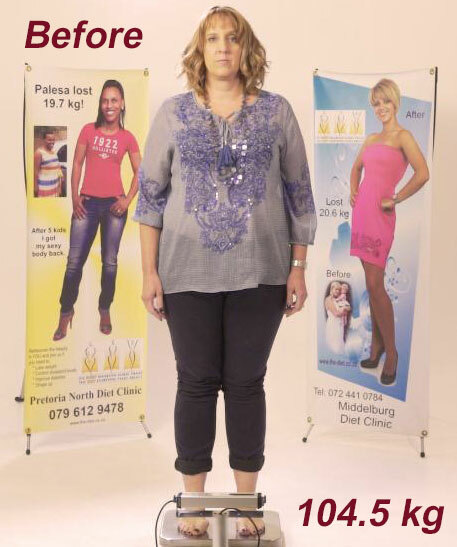 Monique had a starting weight of 104.5 kg and managed to lose an impressive 15.5 kg! She now weighs 89 kg. “I feel very proud of myself because I am now healthier and more confident! My family has been very supportive of me and are also very happy about my weight loss which makes me happy. I now enjoy going to the gym as well as running. My sugar levels are back to normal and I am proud to say that I can now participate in the comrades marathon again,” concludes Monique. Genoeg is broadcast on VIA, DSTV Channel 147 and plays every Monday at 17:30 with repeats on Sundays at 15:00. There are different participants on the show every week. The show airs from the 15th January 2018 until the 9th April 2018. For more information visit VIA.